and the wonderful service projects they perform throughout the year. 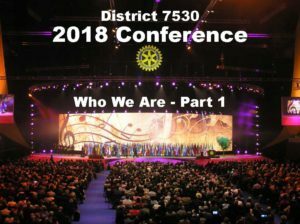 for a weekend of fellowship and and business, as we, together steer our District toward its future goals. Rooms are reserved at $100/night. Please call to guarantee block room rate. Hospitality Suite will be available Friday and Saturday nights. To make conference reservations, please go to DACdb. Submit your username and password and once in the site, choose Calendar. Squadron of the Arnold Air Society and the recipient of the Randolph Lovelace Award for 1972-73. 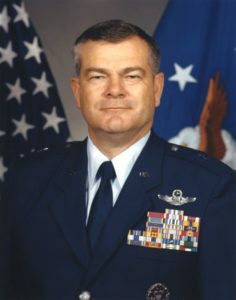 The general completed undergraduate pilot training at Vance AFB, Oklahoma and spent his flying career piloting C-141 and C-5 transport aircraft around the world. He accumulated over 4,100 flying hours traveling to every continent except Antarctica. He held a variety of assignments at the squadron, wing, major command, Air Staff, Joint Staff and Office of the Secretary of Defense levels. He was a squadron, group and wing commander. He retired as the Deputy J-7, Joint Staff, in July 2001. General Bundy was selected to be the Executive Director of Arnold Air Society (AAS) and Silver Wings (SW) in July 2003. He and his wife Judy supported both organizations at the Executive Management Center for ten years retiring in July 2013. The experience of working with thousands of college students in accomplishing their organizational and personal goals was a highlight in their lives and careers. Marge Cole is a Native Californian who grew up in the Los Angeles area. She graduated from University of California, Santa Barbara (UCSB) and earned a Masters Degree at Syracuse University in New York. 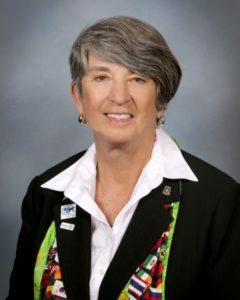 She re- turned to California to teach high school Social Studies and English and served as a high school Principal and Director of Student Services before retiring in 2004. While serving as high school principal, she joined the Santee/ Lakeside Rotary Club in 1996. Following retirement, she joined the Mission Valley Rotary Club in San Diego—nearer to her home. She resides in District 5340—San Diego and Imperial Counties, California, USA. Marge led a Group Study Exchange Team to Central Mexico (D4180) in Spring 2002 and was Club President in 2002-03. At the District level she has held the following positions: GSE Team Leader and Chair; District Rotary Foundation Chair; Ambassadorial Scholar Sponsor; District Governor (2009-10); Council on Legislation Representative (2013); Youth Service Chair; District Grants Chair for the Future Vision Pilot (2010-2013) and Rotary Grants Committee Chair for the District Rotary Foundation Committee (2013-2016). At the Regional level, she served as Chair of the Southern California/Nevada PETS in 2011 a n d as a Facilitator for PETS. She served on Zone Institute planning committees for the Zones 25 & 26. 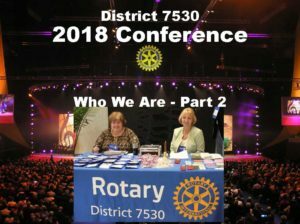 She was selected as Regional Rotary Foundation Coordinator (RRFC) for Zone 26 (Southern California, Southern Nevada, Arizona, and Hawaii) 2016— 2019.